First InSite's easy process and streamlined workflow simplifies the process of providing payment options to all your clients. Advance your value proposition with pre–approved terms, competitive rates and flexible payment options, including pay in full, easy monthly payments, and credit cards. Our team is committed to ensuring that our flexible payment solutions continue to add the most value to your brokerage and provide your clients with choice and convenience. You can easily access our Reference Guides online and Frequently Asked Questions. 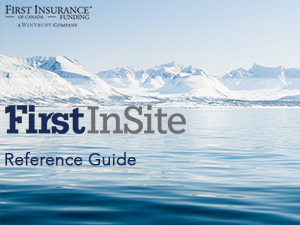 First InSite FAQs is available for your reference. Your dedicated sales and support team are here to help with any questions.